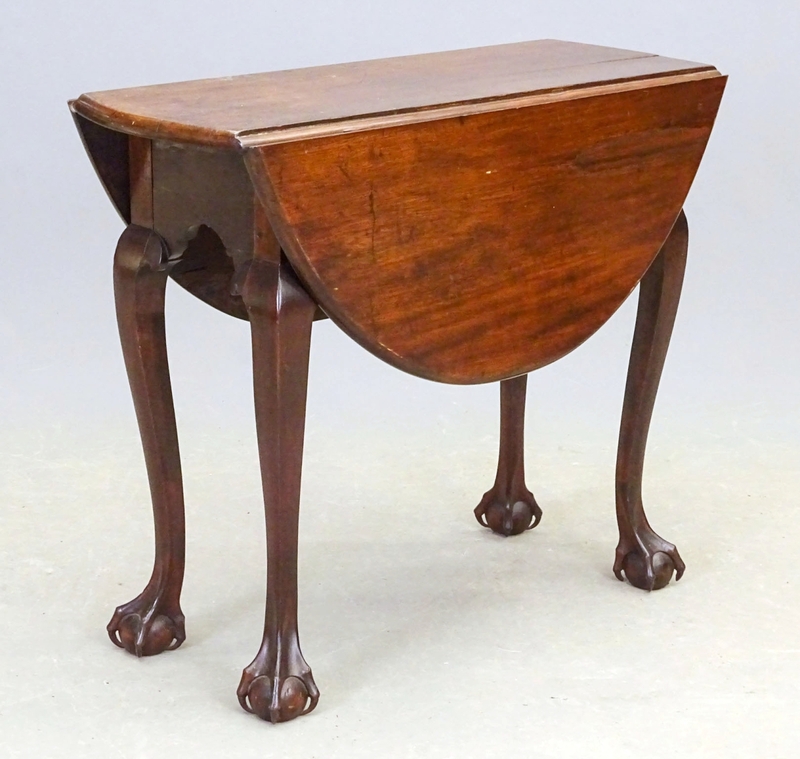 With market sentiment down on period furniture, auctioneer Seth Fallon said he expected this Eighteenth Century diminutive dropleaf table to do well because of the sophisticated carved ball-and-claw feet but was unsure to what extent it would achieve a good price. Measuring 31 by 12 inches with 12-inch leaves, the piece soared from its $500–$1,000 estimate to bring $20,400 from a Kansas City, Mo., dealer bidding on the phone. 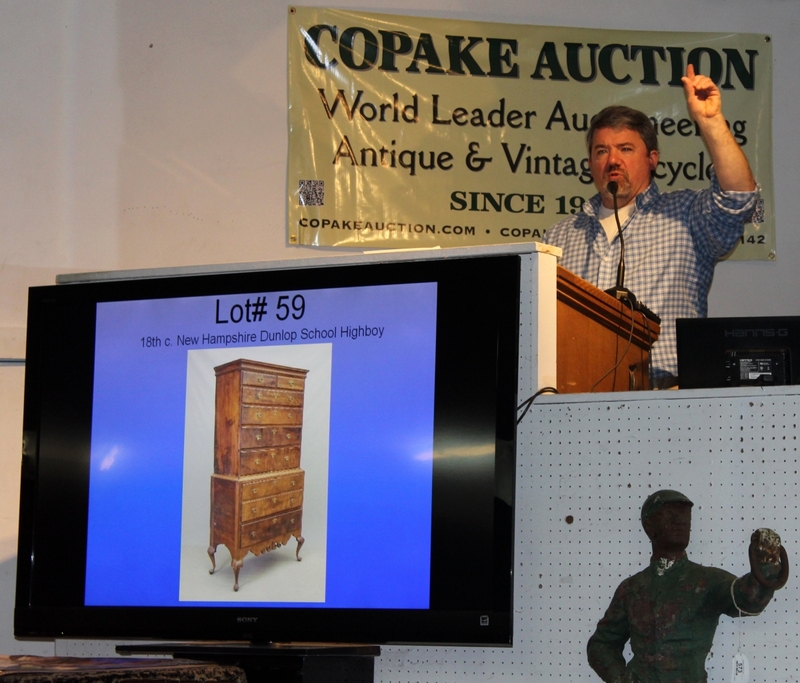 COPAKE, N.Y. – Although the sign out front advertised Copake Auction’s 38th annual New Year’s Day auction, co-owner Mike Fallon sheepishly admitted that he hadn’t gotten around to changing the text. 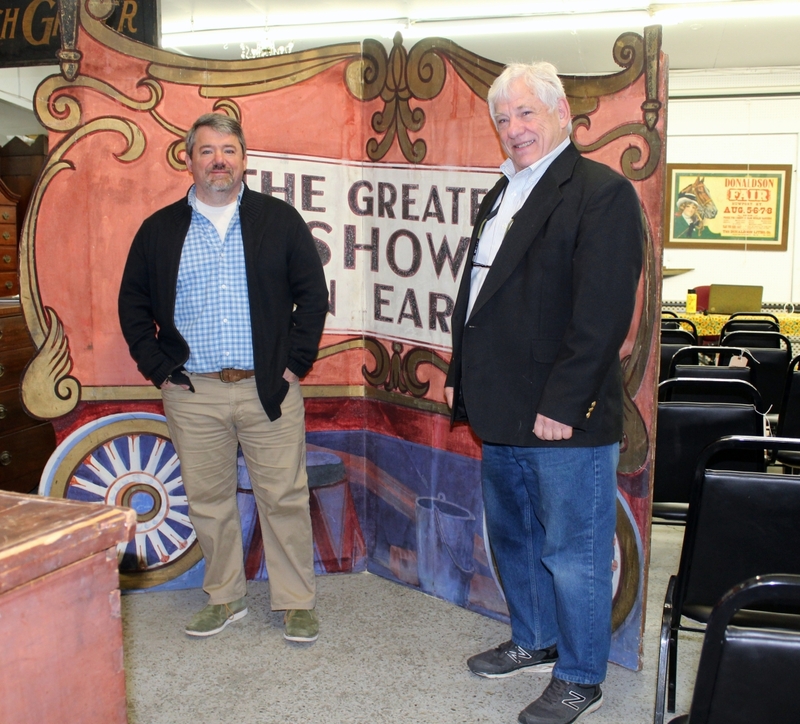 For the record, father and son team Mike and Seth Fallon greeted about 150 patrons who arrived on a relatively balmy January 1 to their 39th annual New Year’s Day auction. It’s an event that both they and their regular customers look forward to every year, and this year’s sale featured some of the best items the gallery has offered in years – all saved throughout the year just for this sale. 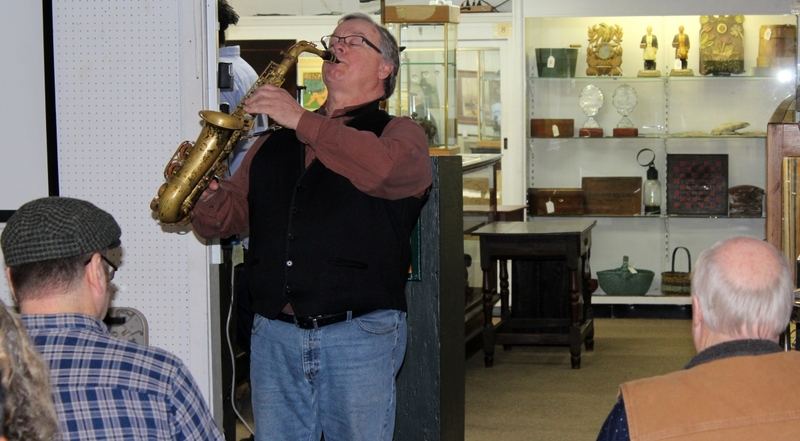 Following a one-hour preview, the auction got underway at 10 am with a lively rendering of “Auld Lang Syne,” performed Guy Lombardo style by Seth’s uncle Don Davis on saxophone. Davis, a multi-reed and flute player, studied composition and saxophone at Berklee College of Music in Boston. He teaches woodwinds at the Manchester (N.H.) Community Music School, and NPR listeners have heard him playing the “Fresh Air” theme. 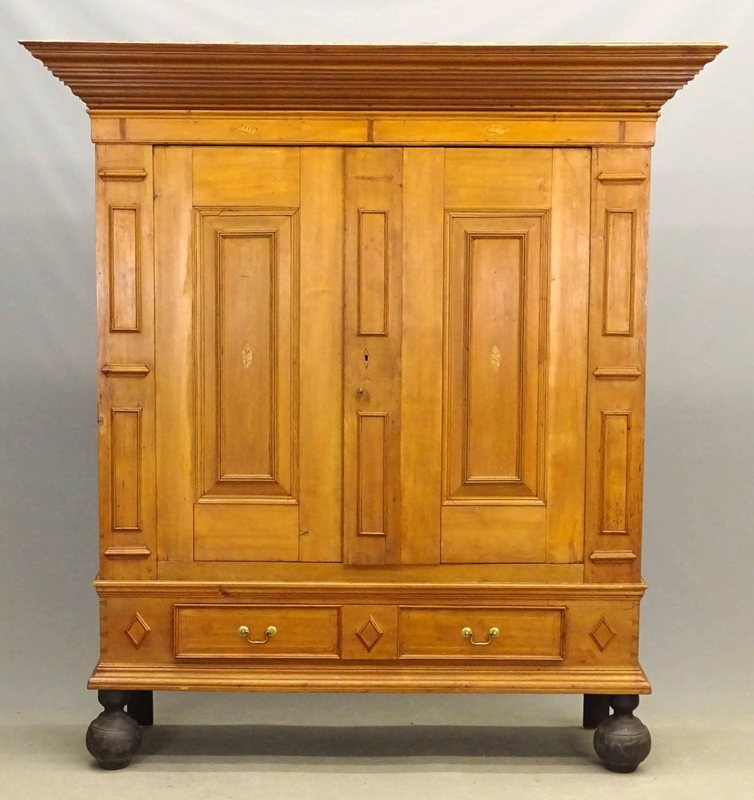 The auction featured a wealth of period furniture – more than 100 pieces. 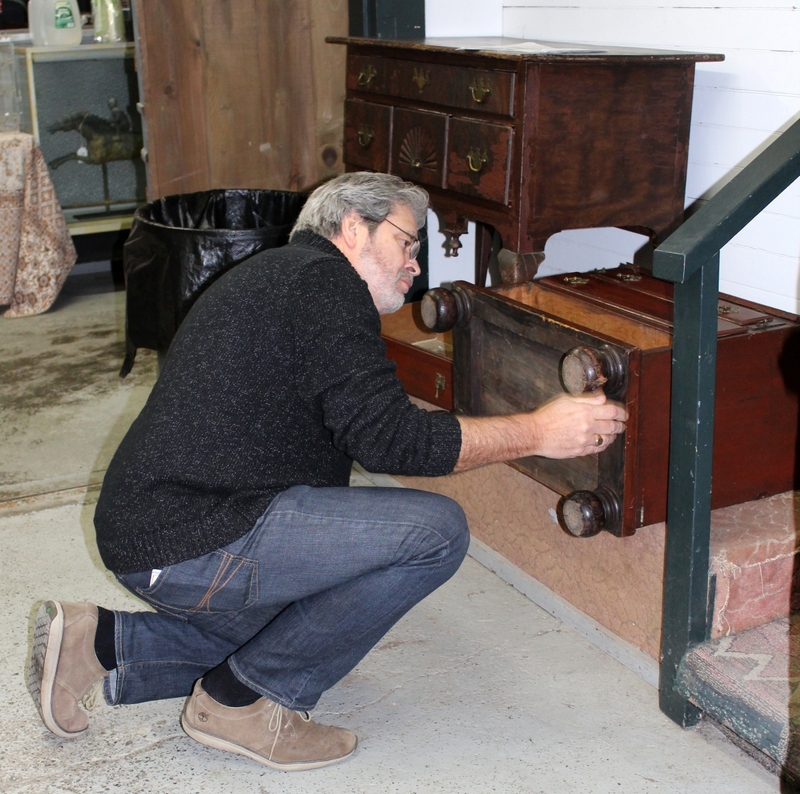 “We have never had such high-quality furniture in one sale,” said Seth Fallon. 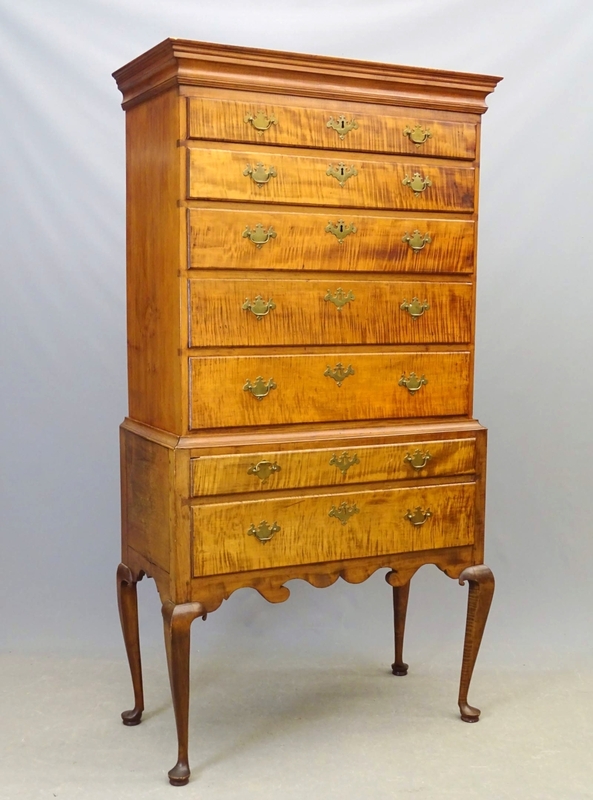 “We are lucky to have a few highboys a year; this year, we had five in one sale!” In addition to the five highboys, there were many Eighteenth, Nineteenth and Twentieth Century pieces, including an Eighteenth Century New Jersey inlaid kas, Chippendale secretaries, card tables, chairs, wing chairs, servers, chest of drawers, an Eighteenth Century New Hampshire, chest on chest and more. It was, in fact, an Eighteenth Century diminutive dropleaf table with killer ball-and-claw carved feet that was top lot in the sale, won by a Kansas City, Mo., antiques dealer bidding by phone. 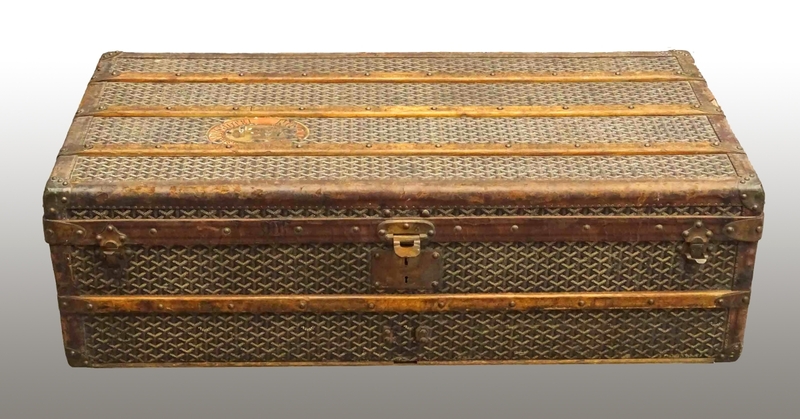 Soaring from its $500-$1,000 estimate to $20,400, the 31-by-12-inch table with 12-inch leaves, was expected to do well based on the sophistication of the carving, said Seth Fallon, although with market sentiment down on period furniture in general, he said he had been unsure to what extent it would achieve a good price. Actually, there were at least two serious furniture shoppers this day. The Kansas City dealer bought a total of ten pieces, and a local dealer standing in the back of the room acquired several for his inventory. Another highlight in this year’s sale was artwork. One of Mike Fallon’s favorite paintings came from an estate in Rhinebeck, N.Y. “The guy showed up in a pickup truck with this in the back,” Mike said, adding that he was immediately impressed with its Homer-esque depiction of young children in a field busily assembling a kite. The oil on canvas by De Scott (David) Evans (1847-1898) titled “Happy Hours” brought an equally felicitous price, selling to a collector for $15,000. An American painter known for working in a number of genres, including trompe l’oeil, Evans was raised in Indiana and spent much of his career in Ohio before moving to New York City. Tragically, Evans and his three daughters died in July 1898, when the Paris-bound steamer La Bourgogne was rammed by a sailing ship; 500 other passengers and crew were also lost. His wife was not on board and later remarried. One of Mike Fallon’s favorite paintings in the sale came from an estate in Rhinebeck, N.Y. “The guy showed up in a pickup truck with this in the back,” Mike recalled. 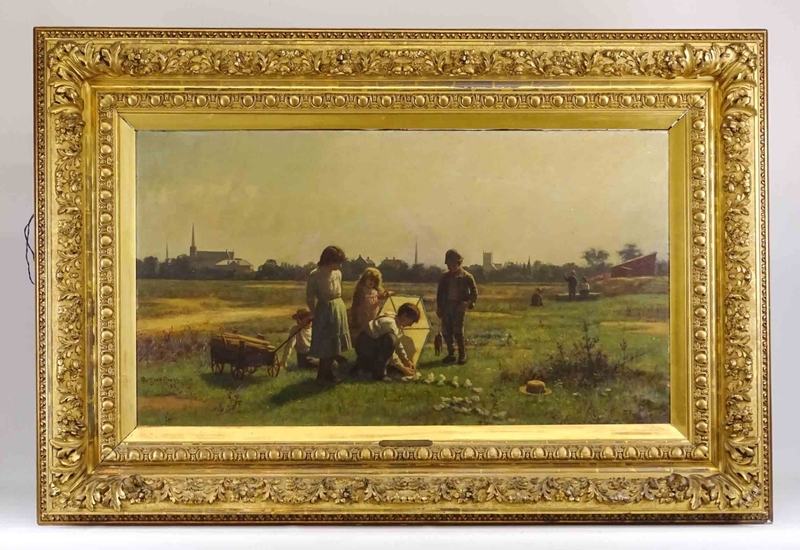 The oil on canvas by De Scott (David) Evans (1847–1898) titled “Happy Hours” depicts a Homer-esque scene of young children in a Midwestern field assembling a kite. Signed and dated 1885 in the lower left corner, the painting fetched $15,000. Overall, Seth Fallon said he was pleased with the prices achieved by fine art in the sale. 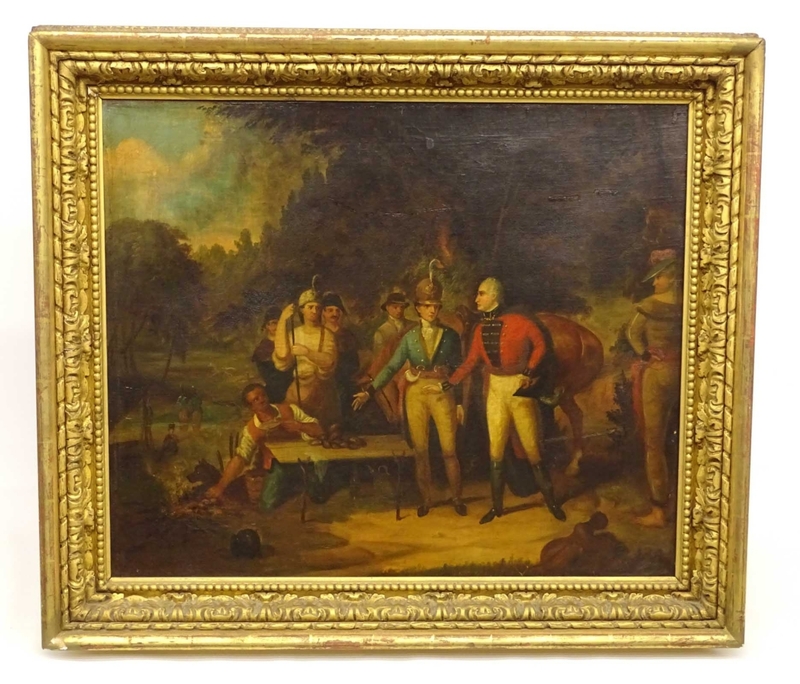 On the traditional side, a historical oil on canvas painting, “General Marion Inviting a British Officer to Share His Meal,” after South Carolina artist John Blake White, attracted at least five phone bidders, who vied for the work until one prevailed for $9,600. The original painting was presented to the US Senate in 1899. According to the artist’s son, Octavius A. White: “The figure of Marion is a portrait from memory, as my father, when a boy, knew him well. Marion’s farm adjoined the plantation of my grandfather.” In the scene a red-coated British officer and Marion, with plumed shako, are placed at right center, with a horse behind them. A motley group of soldiers complete the scene in which an African American man, later identified as Oscar Marion, a slave of Francis Marion, kneels behind a field table, holding a small pan and, with his right hand, roasting sweet potatoes in the fire. During his lifetime, White executed several versions of the scene; similar paintings are held by the Museum of Fine Arts, Boston, the South Caroliniana Library, Columbia, and the Chicago Historical Society. 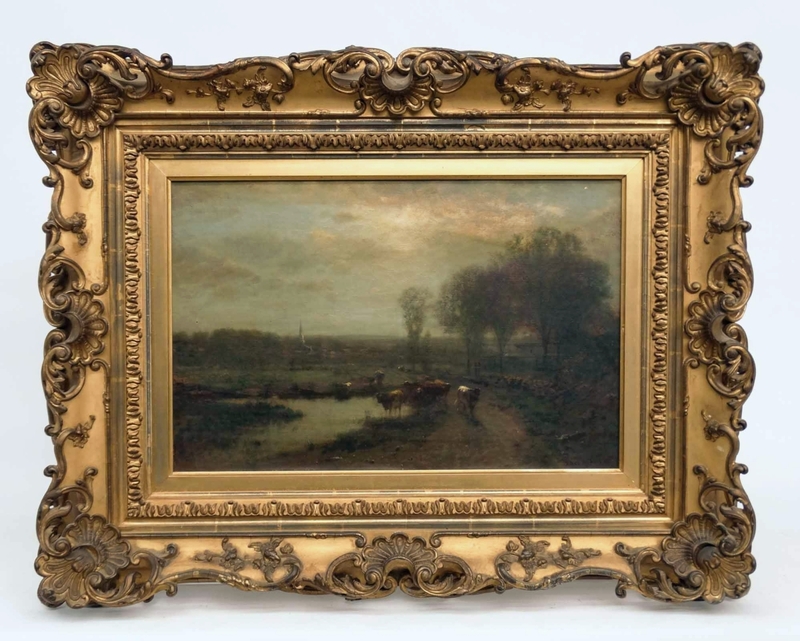 Traditional landscapes did well, too, with a Nineteenth Century oil on canvas depiction of cows near a stream by James McDougal Hart (1828-1901), 17½ by 23½ inches, more than tripling its high estimate to bring $3,900, despite a rip in the canvas. It came from the same estate as the Evans painting. 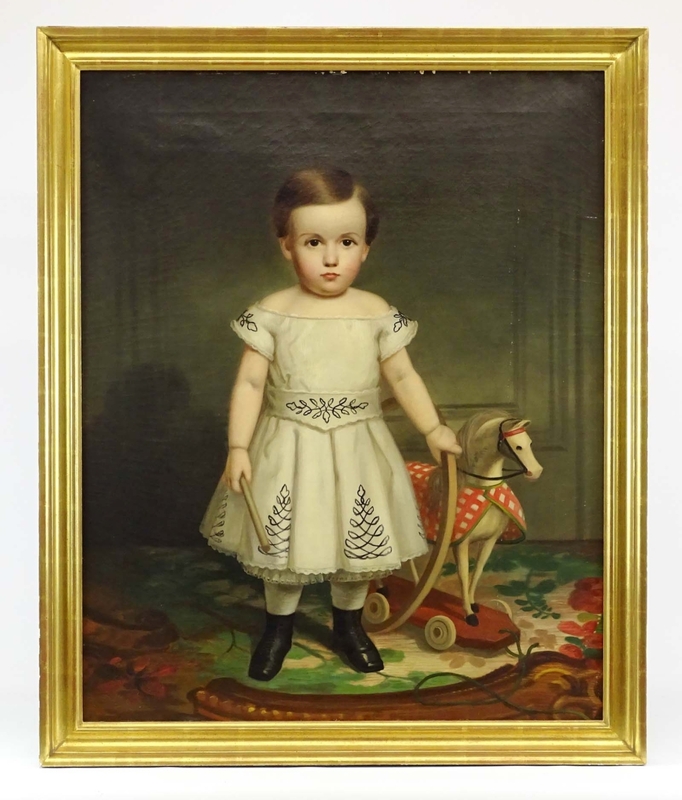 Among portraits, one attributed to Erastus Salisbury Field, a Nineteenth Century oil on canvas portrait of a child with toys, 36 by 29 inches, reached $9,900, going to an in-house bidder. In July 2018, a James Rizzi (1950-2011) oil on canvas street scene, signed and dated 1975, jumped the curb at Copake to finish at $61,360 against a $2/3,000 estimate. It set a world auction record for the artist who straddles to the realms of Outsider and Pop art with his bright, cartoonlike drawings and 3D constructions. Rizzi applied his distinctive style to a large variety of everyday objects – from Rizzi stamps to the Rizzi house, from Rizzi puzzles to the Rizzi jet plane, from Rizzi chinaware to Rizzi cars and trains. 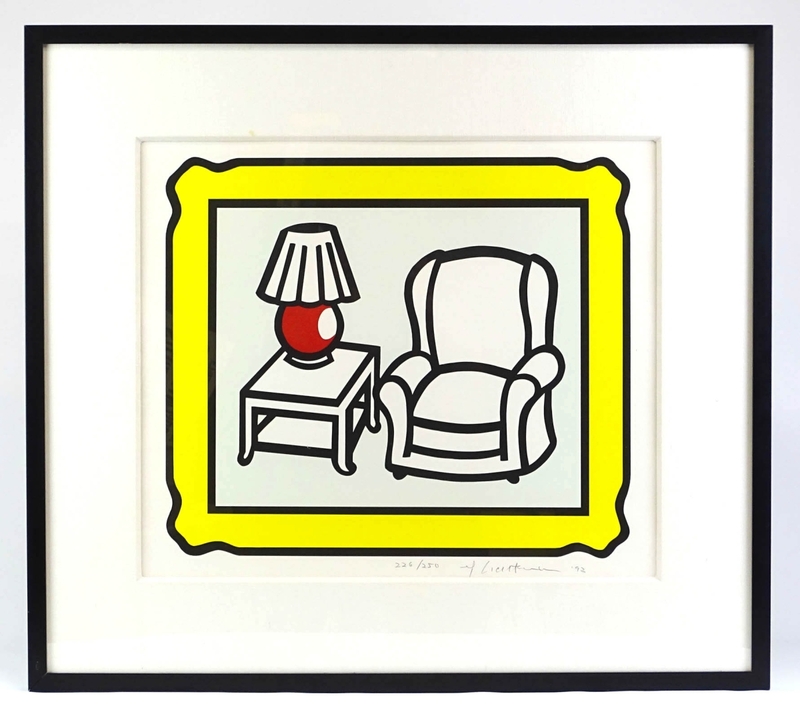 That earlier Rizzi went to a collector in Germany, where Rizzi is popular. 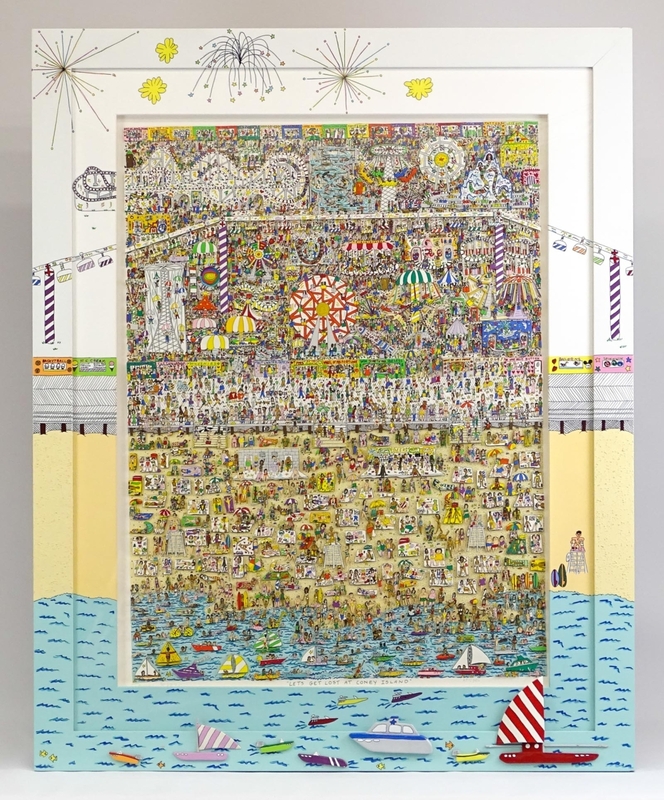 This time around, there were two artworks by Rizzi in the sale, including a mesmerizing, three-dimensional work, “Let’s Get Lost at Coney Island,” which had been consigned to the sale by a longtime Copake customer. The work, measuring 36 by 26¾ inches, went to a US collector for $10,500. 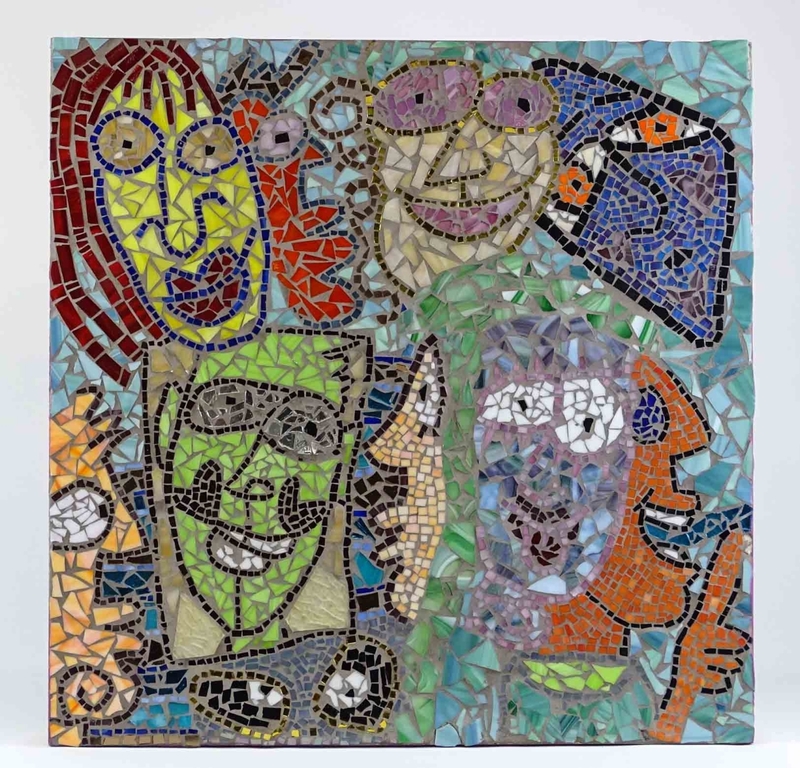 Another work by Rizzi was a mosaic titled “Funny Face,” the only mosaic by the artist the auctioneer had ever seen. Signed and dated “James Rizzi/2001″ on the reverse, the 24-by-24-inch work fetched $3,360 from a phone bidder. 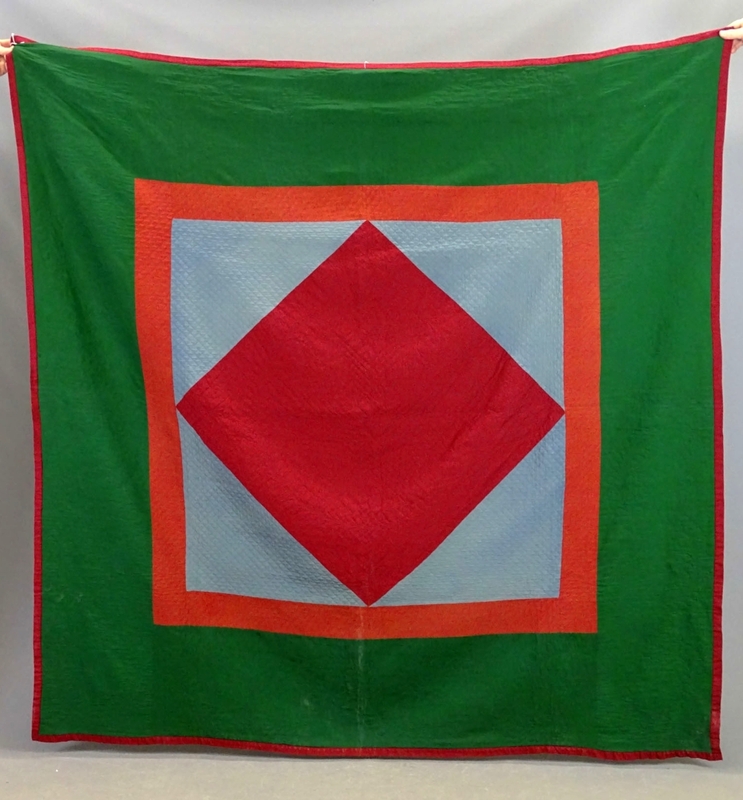 Folk art is always a staple at Copake Auction. 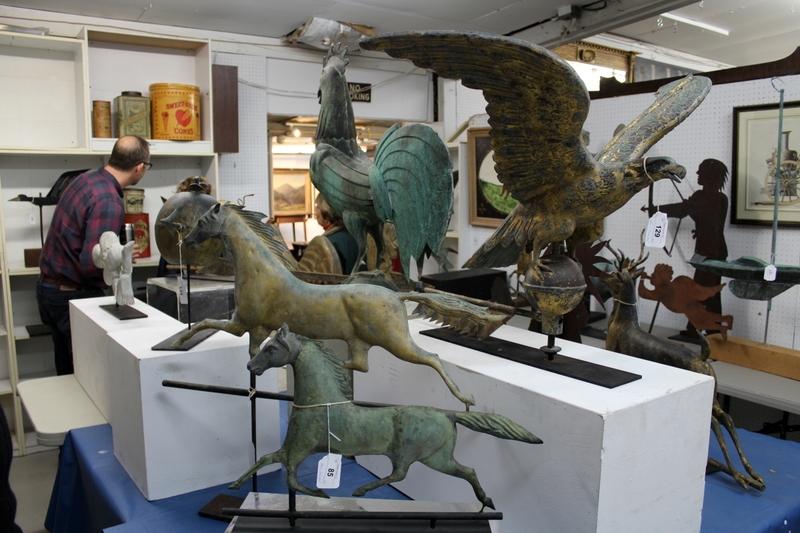 This year, the sale featured more than 30 weathervanes that came from a Connecticut collector who was downsizing, including Statue of Liberty, horses, ram, codfish, tennis player, grasshopper, eagles, pigs and more. During preview, the collection was on view in a separate room in the gallery. 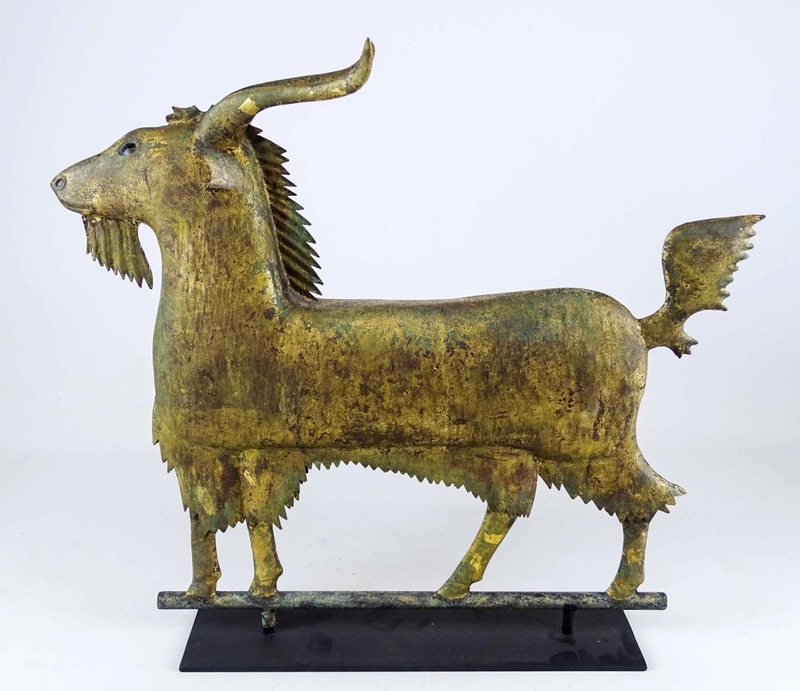 Among the high fliers, a goat example that a collector snagged for $8,700 and a female tennis player that scored $12,600. A leaping stag landed at $6,600, while the Statue of Liberty attracted three phone contenders, sailing off at $9,900 to one of them. During preview there were many folks eyeing an Eighteenth Century spoon wall rack of pine in old red paint. A picker had discovered the Hudson River piece featuring triple fan carving, tombstone crest and T-head nails. 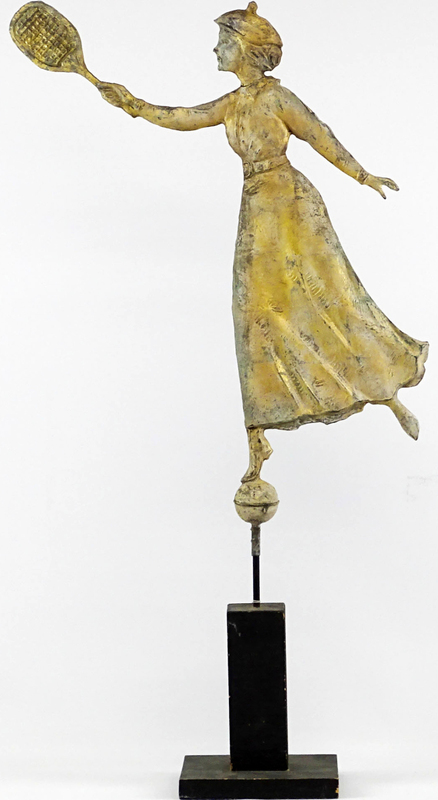 It went out at $4,800, acquired by a major dealer, according to the auction house. 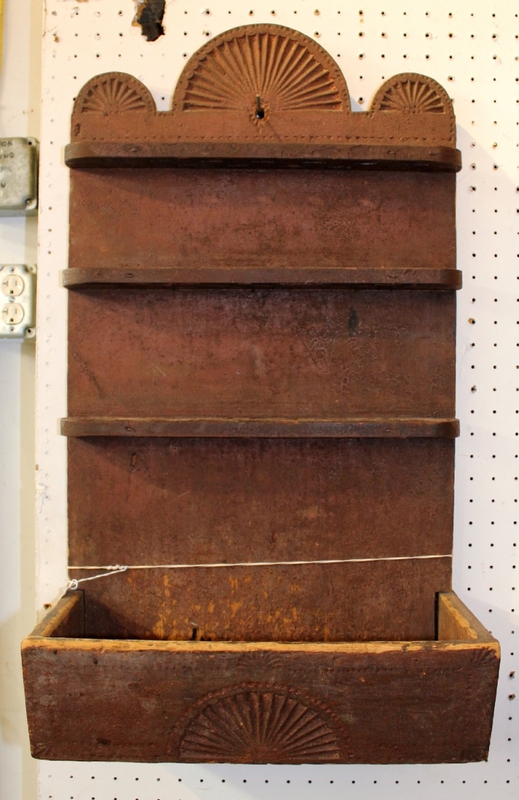 Also featured was a one-owner Midwestern collection of some 30 Nineteenth Century buttocks baskets, most in original paint surface. 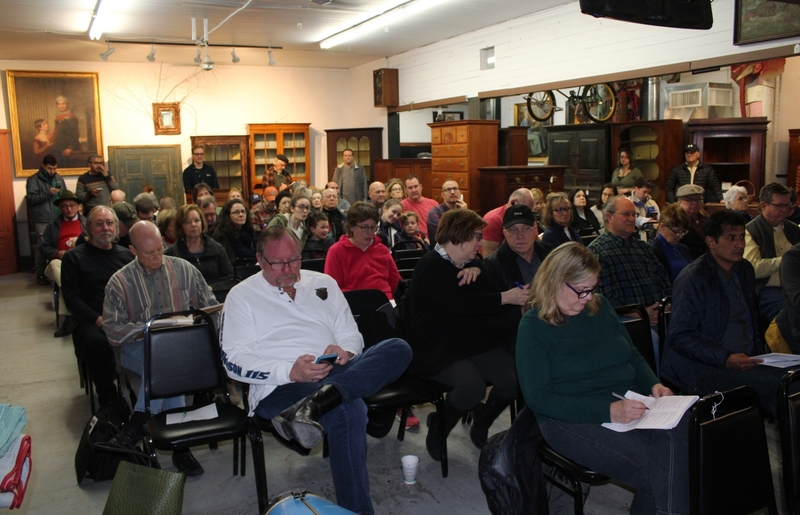 Almost as soon as the gavel dropped on the last of the 694 lots, the Fallons were gearing up for the firm’s next sale, one of its regular estate auctions set for Saturday, February 16. Prices given include the buyer’s premium as stated by the auction house. For information, www.copakeauction.com or 518-329-1142. 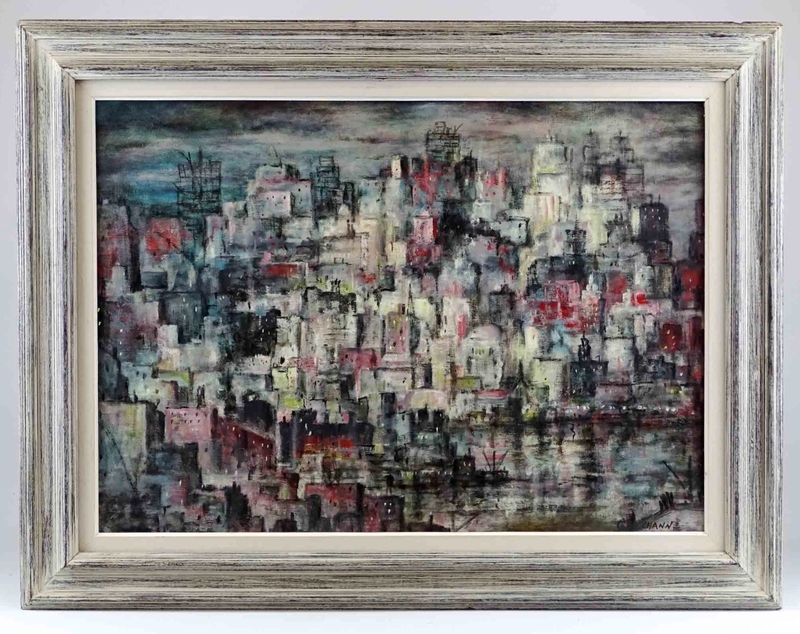 This George Chann (1913–1955) abstract oil on canvas titled “Hong Kong Views ‘67,” signed lower right corner and measuring 20¼ by 28¼ inches, was bid to $7,800.